I often see one of these beautiful raptors working the sage and wetland area of Riverview Park in Carson City. Over the last couple of years, I have watched these beautiful Northern Harriers work the sageland and wetland areas of Riverview Park in Carson City. It took me a couple of attempts to identify the raptor, but I finally got a view of the bird’s head and with the aid of the Merlin application from the Cornell School of Ornithology I made the identification. They are now easy for me to identify — that big white patch on the rump is one giveaway. The second is their mode of hunting is to soar about ten feet over the surface listening for mice. With the acquisition of the red-badge Fujifilm 100-400mm super zoom lens, I now have the capability to capture an image of these birds. They generally do not allow me to get too close, although they will sometimes glide just overhead, teasing me. On this particular morning, I saw the harrier glide over the field. I made a couple of attempts to capture an image but was not satisfied with my attempts. However, the bird soon began a climb, having caught a thermal. I watch it rise up and up until it was a couple hundred feet overhead. It soared in large circles, overwatching its hunting grounds. I stood there a few minutes, knowing that the bird was not hunting but simply flying. Many of the animals encountered during my life have shown an intelligence that is impressive. They do not simply eat, sleep, and procreate. They interact socially among their species and sometimes others. They play. They do things that please them. Otherwise, why would they waste the energy to move from place to place? The best teacher of all is The Girl. She showed me there is intelligence without language. She often talks to me, speaking volumes without making a sound. I get it. 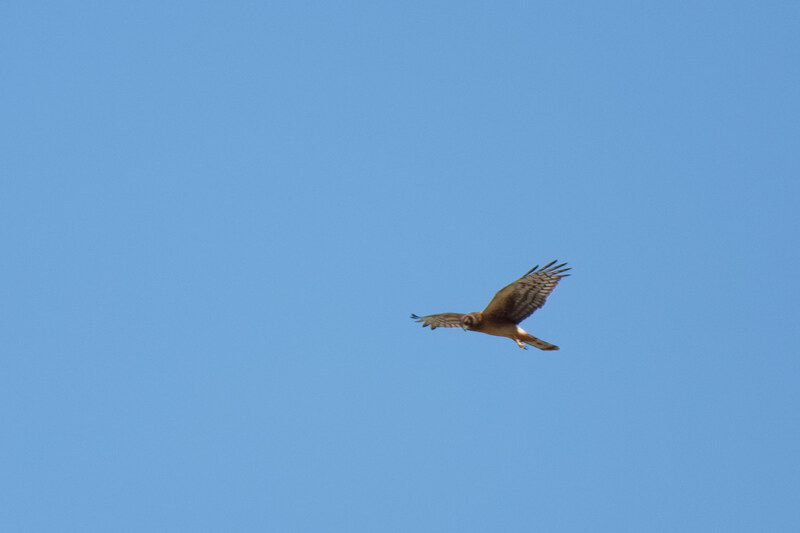 As I stood there on the trail, watching the harrier soaring far above me, I got it. This was not about a hunt, or about turf protection; the soaring was simply for the joy of it. This guy works for Carson City Parks in the Open Space Unit. 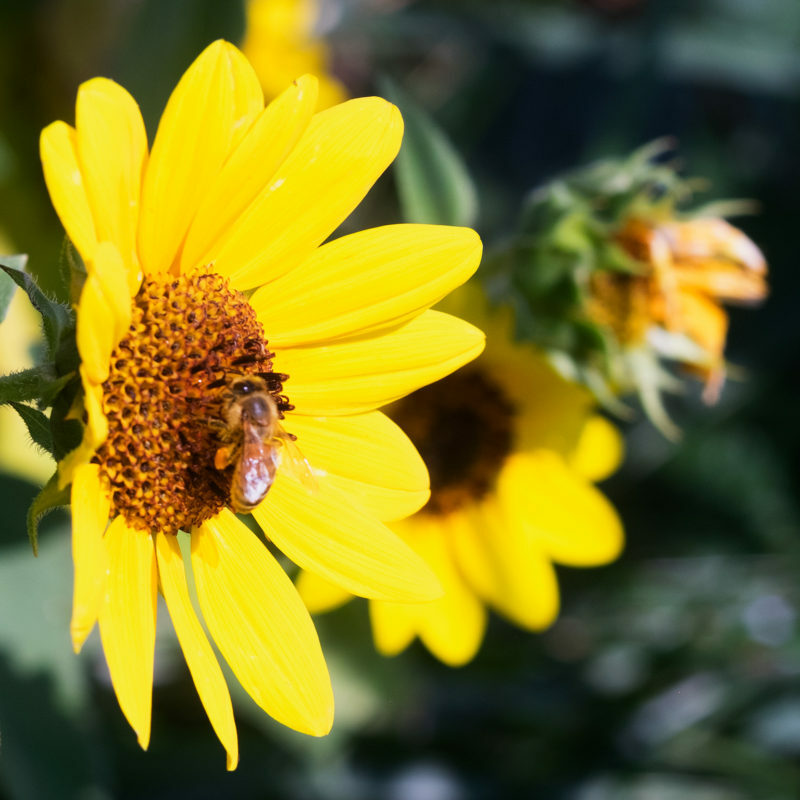 He was maintaining the trail by the Carson River on Silver Saddle Ranch when I met him. We spent a few minutes visiting and I left with a good impression. The Girl and I spend many hours walking along the Carson River on the Silver Saddle Ranch. One morning we met Jarrod (I hope I got his name right) working on the trail. He was clearing the weeds that are no longer kept down by ranch traffic. He had paused for a few minutes to clear the radiator of his rig from the accumulation of dust resulting from the brush hog mounted on the front of the vehicle. 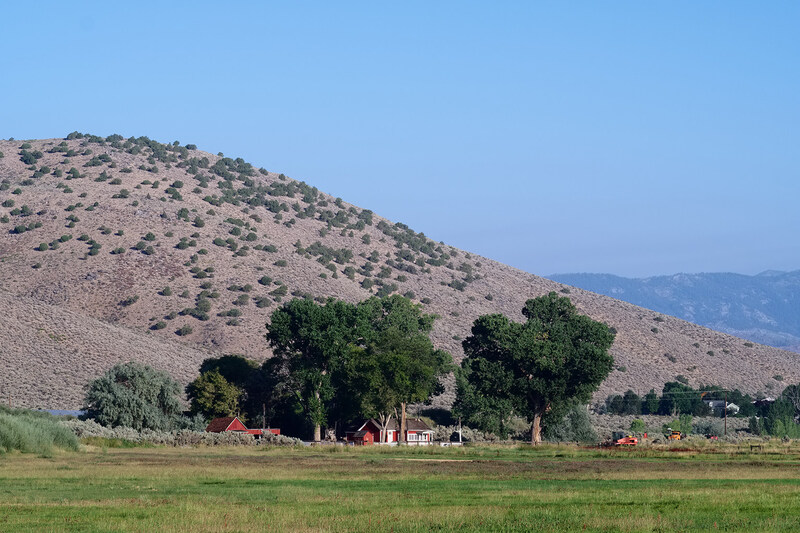 I learned that Carson City received proprietorship of the ranch from BLM some time ago. It should remain as open space in perpetuity. 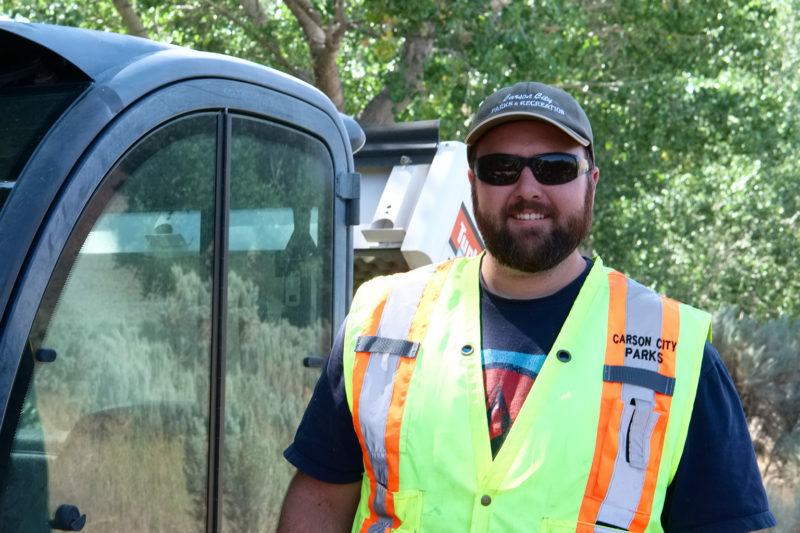 Carson City spends part of its resources maintaining these areas and I really appreciate it. As I said, The Girl and I spend a lot of our time out along the river and it is one of our favorite places. I appreciate public servants like Jarrod, who take both their work and their relationship with the public seriously. He was willing to spend a few minutes talking about the work and the place. It was a good visit and I am thankful that he agreed to pose for an informal portrait next to his rig. I love walking the Silver Saddle Ranch open space area. It’s jointly managed by Carson City and BLM. Since nearly being carried away by mosquitoes at the Riverview Park, The Girl and I have spent our morning walks to south on the Silver Saddle Ranch open space area. The ranch is still a working ranch with cattle and hayfields. I often meet the ranch manager while walking as he tends the irrigation system. The capture is my morning view of the ranch compound. At one time this was a bustling ranch with a number of ranch hands all working from this area. It is nothing of what it once was, but remains a reminder of Nevada heritage. I am thankful that it is maintained as a place where I can spend time outdoors with The Girl. It is also a place where I see many wild animals. There are mostly birds (and I do enjoy the raptors), but we see other species as well. 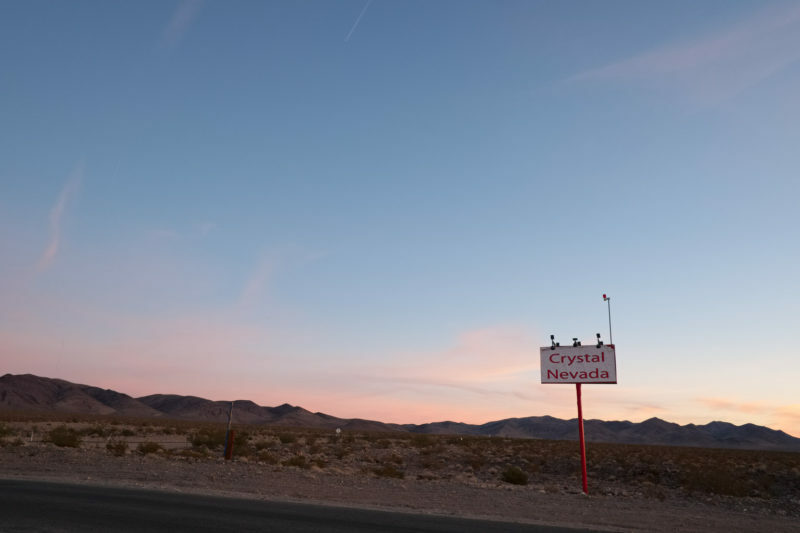 On the road to Pahrump, there is a little town called Crystal, Nevada. On the road down to Pahrump, Nevada, we paused for a leg stretch and to watch the Sun set. Everyone else was hurrying on their way to wherever they were going. We watched them rush by while The Girl and Older Son puttered around the desolate landscape. There are some odd places in this part of Nevada. Hoy’s “Lovership” appears to be one of them. [shudders] No, we didn’t stop there. This morning it will be time to head back to the house. I think we accomplished what needed to be done here. Now it is time for me to work on the project and finish it up. I’m going to enjoy the drive home. I love Nevada. After a fun play, The Girl posed for me. Work once again brings me to Pahrump, Nevada. I’ll have field work to do for the next couple of days. Then we’ll head back home again. The drive down was uneventful, for which I’m thankful. The weather was good and the Sun felt good on my body. The Girl snoozed most of the way here, which means she slept most of the day. We did take a couple of breaks to get out of the rig and move around. But she had quite a lot of pent-up energy. So after getting settled into our room (Older Son is with us), we had a big-old play on the floor. She bounced between Older Son and me, and we roughed her up really well. She was mildly mouthy, which is unusual for her, but she was so gentle that I couldn’t bring myself to admonish her. In the end, she posed for me before I got out her food for the evening. She was hungry, having forgone breakfast in the nervousness of impending travel. We then walked over to the sports bar and got supper for the big dogs. I really enjoyed my salad. I had to correct several personnel there about how to *not* deal with a service dog. 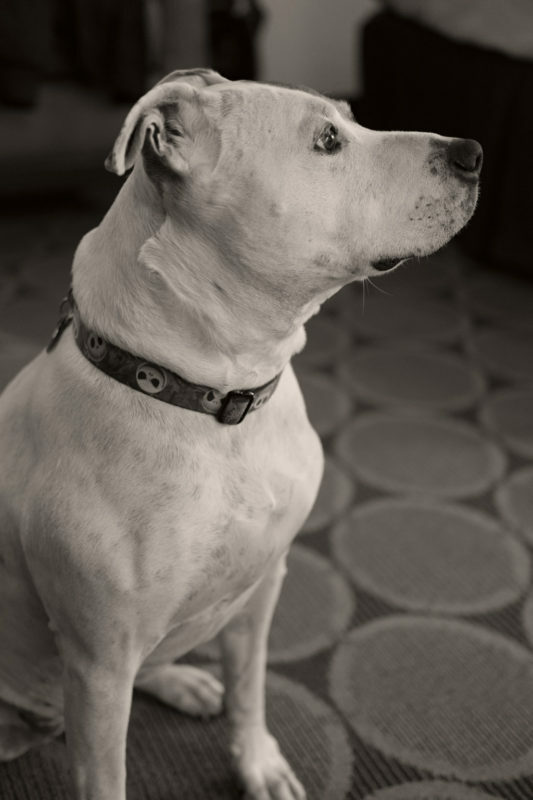 Everyone seems to think they can just approach a working dog and engage. So, once again I found myself having to train service personnel on the proper way to (not) interact with working dogs. I’m pretty good at it. I’m not one of those handlers who loses their mind if someone looks at their dog. (There are many who will.) So I’m a good one for untrained service personnel to interact with. I looked at her, raising my eyebrows, “Break the bartender,” with visions of her actually *breaking* someone. I began to laugh. “No, no, no… I gave the bartender a break,” regardless of me giving her a hard time, she remained (mostly) nonplussed. I was still laughing about this as we paid the bill and headed back to the room. Normally, someone “verbifying” a noun makes me crazy. In this case, I thought it was hysterically funny. This is what I saw just before the storm rolled in on my way back from southern Nevada. On my way down to southern Nevada, I saw something bright against the horizon just north from Tonopah, Nevada. I had no idea what it was that I saw. I only knew that it was very bright, almost blindingly bright even in the distance. I watched as I passed the location, drove through Tonopah, and continued toward my destination. My schedule did not permit me to stop and explore. It would have to wait for another time. That time arrived a few days later, on my way home from the site work. I was hot and tired after working much of the morning in the southern Nevada heat, but I knew it might be weeks or months before I passed this way again. So I elected to take a few minutes and explore. A summer thundershower was rolling in from the southeast as I approached. I could see that the structure was huge. I figured out what it was long before I got close enough to see it clearly. 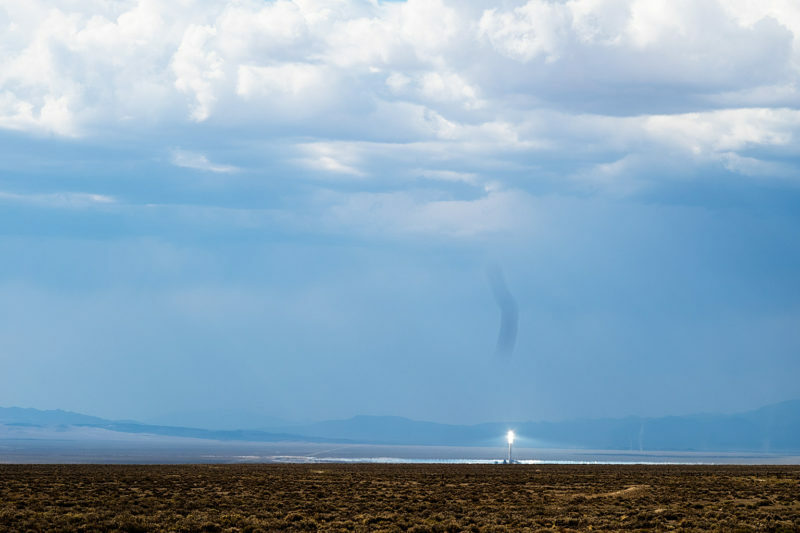 It is the Crescent Dunes Solar Energy Project, privately owned. Of course, by the time I got in position to make a good capture, the dust was blowing and the sun was absent. So the impact was just not there. Now I know I’ll have to return. Perhaps a sunny winter day would be a good time to visit Tonopah, make some captures of this wonder, and visit the mining museum there in Tonopah. At least I solved the mystery. The Girl and I were poking about the old flume wetland yesterday morning. The sun was pretty and the bright yellow of these sunnies caught my eye. So we paused while I made a couple of captures and the Girl did doggies things. On this morning I had the Fuji X-T1 with a Micro-Nikkor 104mm f/4 mounted on a Metabones Ultra Turbo Booster that’s been languishing in my collection for awhile. I decided it was time to get out the X-T1 and some of my favorite Nikkors and work with them. One of the things I like about Fuji glass is that it is impeccable. It is sharp, has good color rendition, and has low distortion. However, I also think the images are a bit sterile. They lack the character that legacy glass provides. It seems that if I want really accurate reproduction of the subject, then the Fuji glass is the way to go. However, if I’m looking to explore the interaction of light and lens, then legacy glass has its appeal. I also enjoy experimenting with odd glass as well. I am playing with 16mm movie camera lenses on my Micro 4/3s body. I also play with TV lenses on that one as well. The Micro 4/3s format is nearly perfect for glass with image circles that are intended for small sensors. But I’m really entering into another discussion than the one appropriate for this entry.